JOTMAN: Ralph Nader: When does activism lead to policy change? 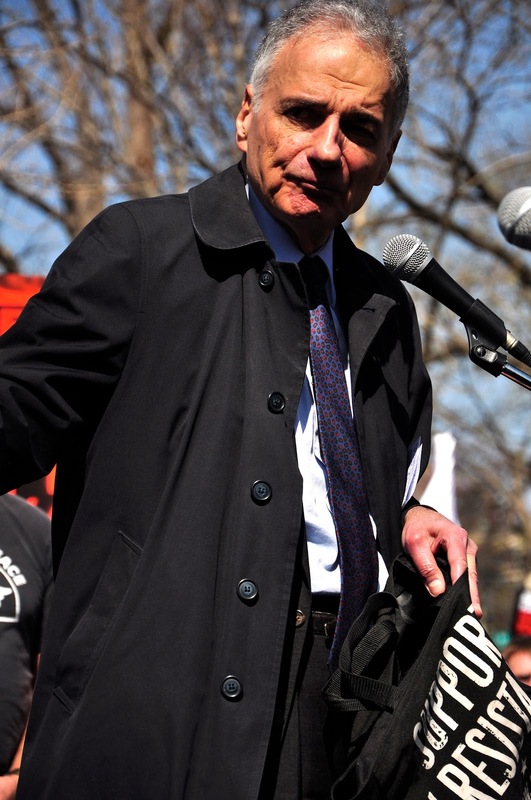 Ralph Nader: When does activism lead to policy change? in Washington, D.C.. Jotman photo. Ralph Nader gave a short speech outside the White House Saturday afternoon, touching on themes that have been close to his heart for years, but for which evidence is more readily visible today. “What Bush did, Obama is doing with better rhetoric,” Ralph Nader said, condemning the “two party dictatorship.” Nader talked about the need to fight the “Military Industrial Congressional Complex.” Congressional? Nader explained that in an early draft of the speech, Eisenhower inserted the word ‘Congressional’ but some aids convinced him to remove the word. Marching on the White House to stop occupations and torture. Jotman photo. After the speeches, anti-war protesters marched. Over a hundred were later arrested. Jotman photo. Central to Nader’s message was that the peace movement already has public opinion on its side: public support for the war in Afghanistan is low. The challenge is to make the politicians pay attention to the people. Nader spoke about the need for the democratic resistance to hire paid organizers. “Full time paid organizers are necessary, every successful movement in history had them from Abolition to Cvil Rights.” Nader pulled some bills from his wallet and put them in a black bag. He said, “You’ve got to start raising money. I see $10,000 that could be raised right here, among this group standing here.” Nader then spoke about the importance of getting in touch with rich people, asking them to help fund a peoples’ movement. He said the rich want to leave a legacy; that some rich people would like to be remembered for having funded a noble cause. All you have to do is ask. Ralph Nader takes questions after delivering a speech. Jotman photo. Nader took questions after his speech. Someone pointed to Egypt’s revolution as an example of a movement that did not appear to have any full-time paid organizers or to have raised a lot of money, yet had been wildly successful. Having just returned from Egypt, I thought it rather too soon to call the Egyptian revolution a success. It remains an open question whether part time, informal activist networking can be translated into lasting policy reforms or democratization. The destruction of the Tahrir campsite by thugs working in coordination with Egyptian soldiers -- which I witnessed -- could be viewed as an attempt by Egypt’s political establishment to undermine the roots of better funded, professionally organized, sustainable modes of political activism. “What Bush did, Obama is doing with better rhetoric”.